1 Fine and rare small size Sheraton mahogany and bird's-eye maple "D" shaped swell front sideboard with bottle drawers and finely figured matched veneers. Massachusetts, circa 1790/1810. 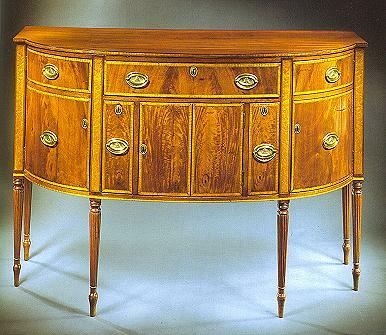 Height: 40 1/4" Length: 57 1/2" Depth: 23 5/8"
Exhibited: "The Bicentennial Exhibition of American Federal Furniture", Georgetown University, Washington, D. C., June 25 to August 21, 1988. Photo Credit: The 1998 Philadelphia Antiques Show Catalog; Illustrated: The Magazine ANTIQUES, August 1988, inside front cover. Also illustrated in "Opportunities in American Antiques" brochure #41, Israel Sack, Inc.